Last year Suwanee Magazine took on the challenge to find the Best Burger in Suwanee. This year we continued our foodie adventure and tasked ourselves with finding Suwanee’s Best Taco. But the search didn’t stop there! We took the contest one step further and asked ourselves, “What goes best with tacos?” Our answer? Margaritas, of course! We are pleased to announce that we’ve found what we believe to be the best taco/margarita duo in Suwanee. Cheers! We invited Suwanee restaurants with a taco or margarita on their menu to participate in our contest this year. In the end, six local contenders delivered a variety of delicious tacos and boozy margaritas to our office. We then invited four distinguished individuals from the local culinary community to judge which one was the best. We also gave our staff members the incredibly difficult task of voting for the “People’s Choice Award” winner. In the end, we discovered that Suwanee has some of the best taco and margarita options in the area – but only one could be crowned the winner! Skye Estroff is the marketing and media manager for Atlanta’s largest and longest-running food festival, Taste of Atlanta. Skye manages all television, radio and print media relationships in addition to strategizing and planning all social media. She is an Atlanta native, a University of Georgia grad and an expert in Atlanta’s best food. Taste of Atlanta has been Atlanta’s premier food and beverage festival for 16 years straight, featuring more than 90 local restaurants. This year’s festival is set to take place October 19th-21st in Historic Fourth Ward Park. Adam Hirsch is a Producer and Director for Cabin 40 Productions and the Co-Founder and Creative Director for GOZA Tequila. Adam has won an Emmy Award for Best Sports Director in Short Form, Silver TELLY Award for Directing, “Best Sports Reporting Award” by the Society of Professional Journalists, and Audience Award for Best Short Film at the Atlanta Jewish Film Festival. Adam brings his unique experiences and creativity to the Goza Tequila team. Goza Tequila is an Atlanta-based owned and operated tequila company and has been on the market since 2015. Goza has already won several awards such as the Brand of Promise Award (Tequila Aficionado) and “Best in Category” at the prestigious Spirits of Mexico competition. Goza is a premium, craft tequila made from hand-selected Blue Agave grown in the Highlands of Jalisco, Mexico, and offers three “Best in Class” awardwinning expressions: Blanco, Reposado, and Añejo. Goza is currently available for purchase in Georgia, South Carolina, and New York, as well as online. Erin Adcock is the general manager at PURE Taqueria in downtown Duluth. PURE Taqueria is a popular Mexican restaurant with killer margaritas and a big, creative menu filled with the fresh, authentic taste of Mexico. Erin’s experience in management and customer service allows PURE Duluth to excel in pairing a great atmosphere with even better food. Jim Shumake is the brain behind some of Atlanta’s hottest food festivals. From food truck festivals to taco festivals, Shumake has tried it all. 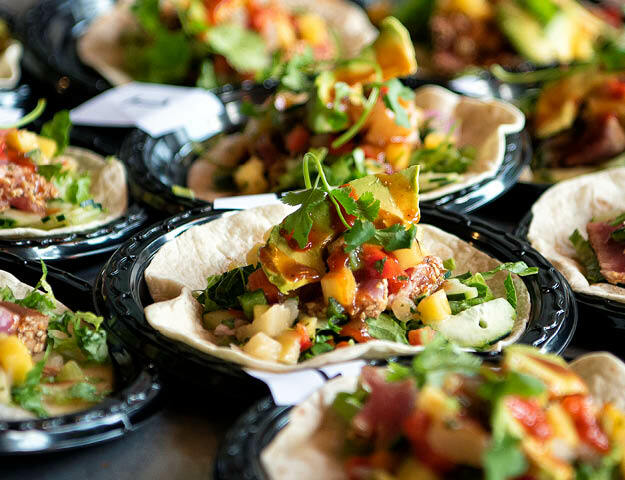 The Atlanta Margarita and Taco Festival recently completed its second year, with more than 40,000 guests and 30 restaurants coming together to celebrate taco love in one of Atlanta’s hottest parks, Historic Fourth Ward Park. Shumake also takes festivals on the road to other cities like Chattanooga and Savannah. Shumake’s newest festival is the ATLCLUCKFEST, Atlanta’s Fried Chicken Festival, taking place Oct. 6 in Candler Park. Filled with braised short rib, crispy bacon, chopped onions, bell pepper, American cheese and salsa verde, served in a flour tortilla. Cajun sesame seared Yellow Fin Ahi Tuna over lettuce and cucumber salad. Topped with house mango pico, sliced avocado, homemade chile sesame sauce with a hint of Sriracha. Spicy but cool while hitting every corner of your palette. Smoked brisket with a spicy coleslaw. NOTE: This taco will be doing a soft roll-out in restaurants soon, for a limited time only. Hand-breaded tilapia, shredded red cabbage, homemade slaw, in-house Friends’ zesty sauce, sharp cheddar cheese, all topped with lime. Jalapeno cilantro slaw with roasted wings, toasted in 3 Mile Island sauce with 3 Mile Island blue cheese drizzle, garnished with celery and green onions and served in a flour tortilla. NOTE: This taco is available for a limited time at the Suwanee location. Thinly sliced, grilled, marinated steak, white diced onions and chopped cilantro. The salsa is made with dry guajilo peppers to be very hot but delicious in moderation. Starting with Cheeky’s Lime Mix (using only fresh unpasteurized lime & lemon, cane sugar, and water), they add Herradura Reposado Tequila, Patron Citrange, and a splash of Grand Marnier to finish this Suwanee-born classic. Centario Plata, Grand Marnier and fresh ingredients made from scratch. Served on the rocks. All fresh ingredients: lime, lemons, oranges, Taco Mac’s exclusive Double Barrel Reposado Herradura Tequila, Grand Marnier, Herradura agave nectar and fresh cilantro with salted rim. Roca Patron Silver, Grand Marnier Raspberry Peach, Chambord, agave nectar, fresh blueberries and lime juice. Freshly squeezed lime juice, orange liqueur and tequila. Served on the rocks. Grilled smokey fruit, marinated in mix and tequila. People’s Choice for Best Margarita was also Taco Mac’s Margarita Perfecta! The Taco Mac team traveled to Herradura, Mexico to hand-pick their own tequila! They got to sample and select the best quality tequila with the master distiller himself. Out of the nine barrels sampled, the team chose three that they wanted to bring back to local Taco Mac restaurants. Each bottle of tequila is double barreled, meaning that it spent 11 months in one barrel and then was transported to a different barrel where it spent an additional month. Each of the bottles that were brought back are labeled with the bottle and barrel numbers that the tequila came from! Taco Mac’s Herradura Tequila is available only in Taco Mac restaurants!